This post is filed under Beef, Big Mac, Cheese, Fast Food, Lettuce, McDonald's, Pickles, White Onions. Man…I’ve really been wanting to try one of these. Too bad they’re not better. I think if they put more effort into them they could actually be a good menu item. 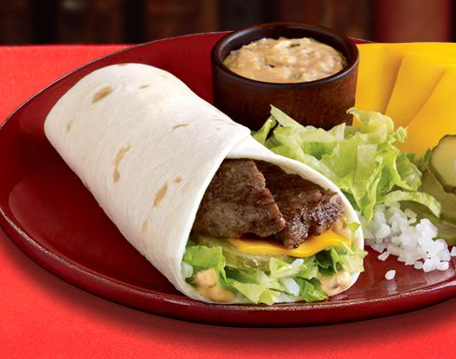 I can think of many other combinations that I would like to try as a wrap from the McDs. Is this supposed to be healthier because its a wrap? Cheese and flavored mayo. Has health written all over it. They could use a smaller tortilla. What’s the point of using a huge, 12″ tortilla and only putting in that teensy amount of filling? Yeesh! I don’t think this review should be taken to the bank necessarily. 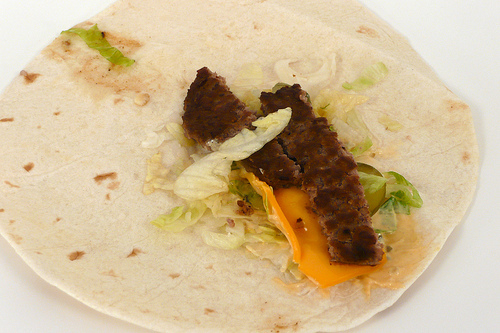 It seemed like the wrap scored so low on taste because there were too few ingredients. 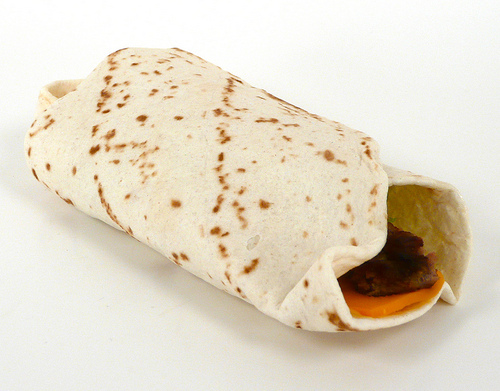 I have had many a snac wraps and more often than once they have had a proper filling of the “accoutrement”. Perhaps you should try purchasing a few more at some different restraunt locations and see what comes of that? What a ridiculous excuse for a “sandwich.” At least with their chicken snack wrap thingy you get a mostly-filled tortilla. This is just sad. Apparently I haven’t been to McDonald’s recently. This sounds and looks awful. Just order a cheeseburger! Actually it looks like someone sneezed into a used piece of toilet tissue. Is this a joke? Or is this a real McDonald’s product? I’m appalled. It’s surprisingly not bad when you do get a bite with everything in it… The dry beef is a problem though, especially with the also-dry tortilla. ha what a rip off. i started my own site called “fast food in real life.” http://ffirl.com/. it’s pretty much the same concept but only targets fast food. haha. This made me laugh. I’ve been wantint to try one of the wraps since I read it had a good controlled amount of calories. But after seeing this, I see why! Its amazing how the picture looks nothing like the real one in life. Crazy! I’ve had these a couple of times in New York (the Bronx) and in White Plains, NY and each time they have been exactly as the one shown on the plate. Guess it depend on the individual McDonald’s / workers. Just had one of these, it was awesome, there was plenty of filling , just like a big mac really. Definately my new fave, didnt know what to expect but im hooked now….. I had one of these. It was just as described here. Never again. I have to say, for a Mcdonalds menu item, I like these. The ones I have tend to have more fiolling in them, and they are a relatively healthy snack. I usually only go to Mcdonalds to get the dog a McDouble, so the Mac Wrap is a nice treat for me as well!